All animals and insects are susceptible to illness and disease caused by viruses or bacteria. As bees forage to get pollen and nectar they may pick up organisms and inadvertently bring them back to the hive. 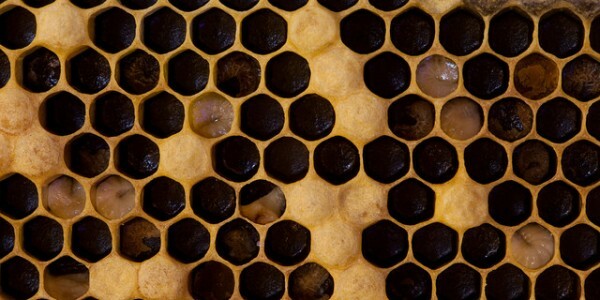 Many diseases that infect bees affect the youngest brood – developing bees still in the larval stage. This developmental stage is when bees are most vulnerable. They don’t have legs or wings, are confined to a single cell in the hive and rely on nurse bees to feed them. When a disease affects brood, colony population can shrink, as there are fewer new bees to replace older ones. Depending on the size and strength of the colony, and the severity of the disease, colonies can often recover. Managed hives can recover on their own or with the aid of a knowledgeable beekeeper. Caused by a fungal parasite Nosema, it infests the intestinal tract of the adult bee, leading to malnutrition and a shortened life span. There are 2 species of Nosema N. apis and N. ceranae, with slightly different effects on the bee. American foulbrood (AFB) is caused by a bacterium (Paenibacillus larvae) and will only infect bee larvae less than two days old. The larvae consume bacterial spores in their food and become infected, but do not die until after their cell is capped. The dead larvae contain bacteria spores that aid in the spread of the disease. It is highly infectious. European foulbrood is also caused by a bacterium (Melissococcus plutonius). It also infects larvae but is less serious than AFB. EFB is often considered a stress disease and hives can recover naturally from an infection. A fungal infection that grows in the gut of larva until after the cell is capped. Then the fungus consumes the larva, turning it into a chalky white mummy. Caused by a virus (Morator aetatulas). Infected larvae die soon after capping becoming a fluid filled sac with an outer skin. Dead larvae are grayish in color and have a banana or gondola shape.